Liverpool career stats for Jack Balmer - LFChistory - Stats galore for Liverpool FC! Balmer was spotted by Everton when playing for Collegiate Old Boys, an amateur club that was founded to provide a football facility for old boys of the Liverpool Collegiate School. The Blues gave Balmer a trial and he played for them as an amateur for two seasons. The Balmer name was already well known at the club as Jack's uncles, Bill and Bob Balmer, had both been popular players at Everton in the early part of the century. Everton decided not to keep him for a third season and Liverpool snapped Jack up when he was only 19 in May 1935. Balmer signed professional forms for Liverpool three months later. He came back to haunt Everton in the Merseyside derby on 16 February 1938 at Goodison Park when he scored inside 30 seconds in a 3-1 win! After losing potentially the best years of his career to World War II Balmer resumed League football after the war and was the club's top scorer, equal with Albert Stubbins as Liverpool won the League Championship for the first time for nearly a quarter of a century. It was during that season that he scored hat-tricks in three successive first division matches in November 1946; Portsmouth, Derby and Arsenal being his victims. Naturally when Balmer had netted twice against the Gunners at Anfield the crowd wanted one more. Balmer completed his hat-trick in the sixty-eighth minute when the score was 2-2. "All that was needed now was a Balmer goal to make three hat-tricks in succession," reported the Echo. "No sooner had the words been spoken than Eastham started the run which produced an angled chance for Balmer, who veered to the right, and put the ball into the net to the biggest cheer Anfield has ever known in its long history. Having scored a hat-trick of hat-tricks, and 10 goals in three matches, Balmer must have established a record which will stand for many a year. He was mobbed by his delighted teammates." He became the third player to achieve that feat in the top division; first to do so was Tottenham's South African Tom Jennings in 1925 with Frank Osborne at Leeds following in his footsteps in 1926. Incidentally Liverpool were in each instance involved in their scoring run, Osborne scoring three against the Reds on 24 October 1925 at White Hart Lane and Jennings four at Anfield on 2 October 1926. Since Balmer joined this select group of men no one has managed a hat-trick of hat-tricks in the top division. Balmer was a prolific scorer for Liverpool throughout his career and is one of the few men to have scored over 100 times for the club in all competitions. Balmer was a tremendously skilful and clever player his refusal to get stuck in with well-placed tackles made him unpopular with a certain section of the Liverpool crowd. "Maybe I didn’t go in for the crunch tackle but that kind of thing wasn’t my idea of football," Balmer admitted. "I was never a coward at the game but I got a shudder when I saw the boot going in." Balmer was captain of Liverpool from 1947-1949 and a coach at the club from 1952-1955. On your marks! 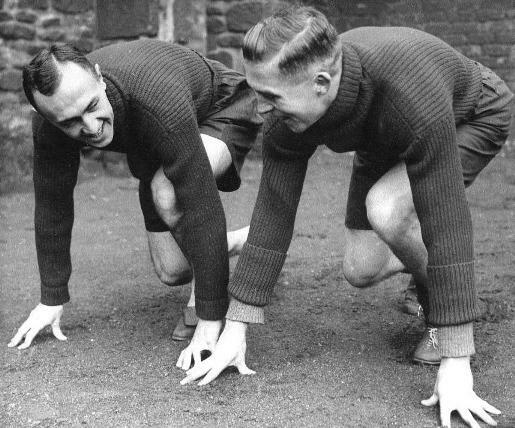 Balmer ready for a sprint with fellow Liverpool striker Fred Howe. The three League games played in the 1939/40 season were expunged from Football League records as the season was stopped due to World War II. The games are therefore not considered valid by LFChistory.net and as the "Association of football statisticians" does not count them towards official player totals. The Liverpool Echo report on Everton 1 - 3 Liverpool played on February 16, 1938. Jack Balmer's career at Liverpool was no walk in the park. The Liverpool Daily Post on Everton 0-3 Liverpool on 27 September 1947. "Towards the end of a long career memories crowd thick and fast on one. That which remains most fresh in my mind was when I had the good fortune, thanks to the unselfishness of my team-mates, to score three successive hat-tricks in 1946-47." "I thought a lot of him. If Jack had had a little more 'devilment' in him, he would have been one of the best inside forwards in the game."